May of 2011 saw the DSiWare release of B Team - Episode 1: Dust & Steel. 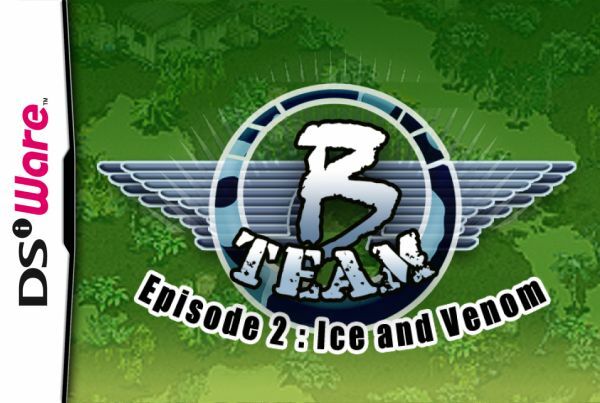 Now, a short three months later, the gang is back in B Team - Episode 2: Ice & Venom. Anyone who played the first game (or read our Dust & Steel review) will know exactly what to expect here. As this game clearly shows, consistency is not always a good thing. Picking up where the first game left off, Ice & Venom adds two new campaigns to the B Team’s story. 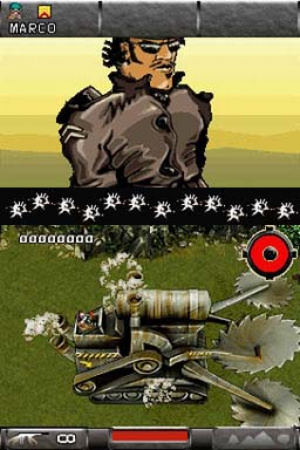 Both retain the same silly humour and cartoon art style of the first game, as well as all of the gameplay features. It is your job to take charge of a squad of three members of the rag-tag B Team, a group of mercenaries who are given the task of wiping out the bad guys. While there is no actual plot in this game, all of the missions consist of you either killing a certain number of enemies, rescuing team members and getting to a rendezvous point, or blowing up certain buildings. Across both campaigns there are a total of 16 levels with five boss battles scattered in-between. 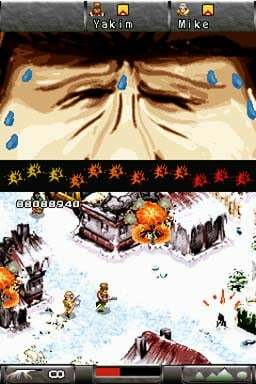 Because of how few levels there are, the entire game can be completed in no more than two hours. Just as it was before, your lives and fire-power are tied to your three team members. While all three characters appear on-screen at the same time, you only actually control one of them with the other two following close behind. All three will shoot in the same direction, but only the one that you are controlling can take damage. Once all three have died, however, it’s game over and you must start the level again. Besides the campaign, there is also multiplayer, but no Download Play option is available. Beyond this, there are no other modes of play aside from replaying individual levels that you have already finished. As far as graphics and audio go, everything is a bit bland and compressed in both look and sound. The environments are plain and not particularly remarkable to look at, mostly following a linear path. The audio sounds about as bad as the game looks, and the soundtrack consisting of only one song can get a bit grating after a while. The one thing this game fails to do is stand out as a remarkable run-and-gun game. In a genre that has the potential to be so much fun, it is disappointing when a game does little to take advantage of this. Despite its charm and humour, this game falls flat due to the gameplay being nothing remarkable at all. 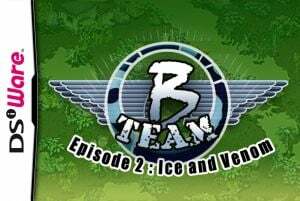 While B Team - Episode 2: Ice & Venom may not be the worst game available for DSiWare, it is far from the best. And the fact that it does absolutely nothing beyond its predecessor makes this a tough sell to those who were either unimpressed or simply uninterested with the first go around. With its bland gameplay and lacking amount of content, there’s a lot more fun that can be had with 800 Nintendo Points. £4.79 / 8.29 € ! Don't know sh** about US prices and availabilty though. Ordered this game some time ago. Since it looked very interesting to me i had to get it for a low price. Have yet to play it though.